The educational environments that we develop and learn within shape our expectations of the work environments where we later work. The two environments are progressively becoming similar, as both fundamentally continue to support activities related to learning, focusing, collaborating and socializing. Traditionally, the dominant educational paradigm was the ‘instructional paradigm.’ However, there has been an active shift from the instructional paradigm to the learning paradigm, to promote deeper student learning – active rather than passive learning. Today, it is not just about transferring knowledge, but instead it is about creating environments and experiences that bring students together to generate, develop and share knowledge; to create communities of learners that solve problems and innovate. Similar to educational environments, workplaces are also promoting autonomy within employees and emphasizing trust and respect within relationships. 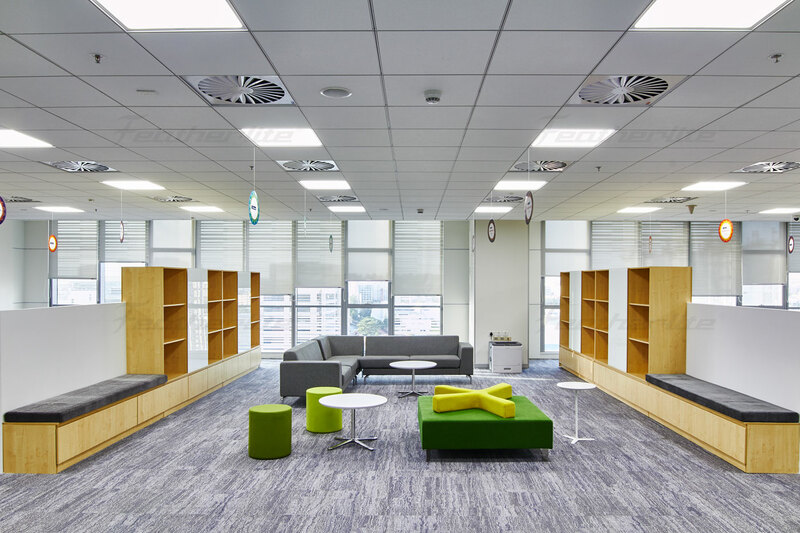 As workplaces become more flexible through space sharing and unallocated workpoints, they are beginning to mirror our educational environments. On a daily basis an individual collects their belongings from a locker, typically located within a bay they have been assigned to based on a group association. They then head to a behaviorally defined area with appropriate tools and resources to support the activity that they need to do either independently or collaboratively. In both educational and work environments there is a continuous forming and reforming of groups based on work and personal needs. As we progress through our education, we are treated more like adults with autonomy and trust. We are acknowledged as individuals with empowerment to make choices. We are responsible for what we achieve, whilst being a part of a group with a common purpose. When creating flexible workplaces, we can apply some lessons from educational environments which have been successful in supporting people functionally whilst fostering their identity development and supporting their psycho-social needs. Think back to when you were at school. Despite being in different classes or subjects to your peers throughout the day, you still felt like you belonged to a group (I know I did) – why is that? When in primary and secondary school, at the beginning of the day and at other regularly structured periods, you physically came together with your ‘home group’ to connect. Although this may have felt governed, this connection made you feel like you belonged and allowed for relationships to develop. Through the connection you received some orientation, mentorship and guidance. Importantly, these connection points were sometimes purely social, recognizing the human side of learning. Engaged organisational cultures also promote such human community togetherness which require advanced planning in flexible workplaces. In addition to socializing at school, you also had access to spaces where you could ‘break out’ – sometimes to just retreat from others, relax and reflect by yourself. At tertiary school, you knew where to find people like yourself based on your interests, as your activity areas or classrooms were housed in a common faculty building. In addition to finding the ‘right’ people, you knew where to find the right tools and resources to support your work. You had access to independent resident and collective conference areas, where you self-directed your own work and learning that was evaluated on the results you produced. No matter how flexible our workplaces become, we need to ensure that we apply the integrated lessons from our educational environments. People need to regularly connect to each other to feel like they belong. They need to be able to find each other, and we need to actively promote accessibility with the reduced visibility of flexible working.